The Jim Turner story will no doubt be hitting the press soon. It began yesterday, with a simple Facebook comment. Last night, I found reference to some guy claiming to be voting 5 times. They included a link to a screenshot of a Facebook post. Initially, I thought “probably a hoax – who could be ignorant enough to post such a thing on the Internet?” But, I was angry enough that ANY American thought it was okay to do such a thing, regardless of party. To me, any attempt to rig or fix the “1-man, 1-vote” elections in our society is tantamount to high treason. I was furious, so I decided to dig a bit further. I found multiple Twitter and blog instances beginning to pop up about this photo and realized that what I’d found was just a few hours old – it had not yet begun to go viral. Here’s one blog post about it. After searching Facebook for a “Jim Turner” and scrolling through many hundreds of Jim Turners, I saw the matching photo and opened up his Facebook page. …which seems to explain why mr. Turner might broadcast something like voting 5 times to the world; he’s an Internet novice and has no idea the world will see it. It appears that he may be referring to the same “bold comment” post that ended up going viral, which “Jami” may have deleted on his behalf, knowing just how very many people would see it, but someone saw it first and got the screenshot before it was deleted. Alternatively, he may have posted elsewhere, which ended up viral. 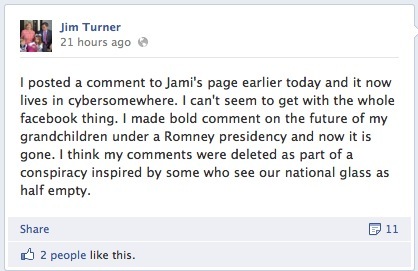 Either way, Mr. Turner’s Internet ignorance doesn’t negate that voter fraud is a most treasonous crime. I googled for Jim Turner in “PKS” (Pine Knoll Shores) NC and came up with his info. His Facebook page had mentioned his wife Jean, so I knew this was probably the correct Jim Turner. Early this morning, I called PKS police department and FBI’s North Carolina Field Office. They were quite interested in hearing more. I have forwarded all the information and assured me they’ll be pursuing it diligently. My goal is to ensure that only one vote is counted in the election; whatever happens after that is up to authorities. As an American citizen, I feel it’s everyone’s duty to combat election fraud on all fronts and I’d like everyone, regardless of party affiliation, to work together to ensure that this crime and any other known voting crimes are investigated and prosecuted. If this were someone from my own political leanings, my response would have been the same; I’m an American FIRST; political ideology comes second. We have the world’s greatest military security and the world’s LEAST secure voting system: Bin Laden himself, were he alive, could walk right in and vote on Tuesday. That’s incredibly disturbing to me, when I consider how very many lives have been sacrificed to ensure that we each get those votes. Between that and people trying to rig elections, regardless of their political affiliations, I believe we as US citizens have the obligation to combat voter fraud on every front until we can get some security laws established. Winning an election is NOT worth selling out your country. These acts are nothing short of treason. I do not know Mr. Turner; never heard of him before last night and I live halfway across the country; I’m just doing what I believe every citizen ought to. My main concern is ensuring that each stakeholder in this country only gets one and only one vote, that each voted gets counted and that nobody who isn’t a stakeholder is ever allowed to vote. Personally, I’d like to see Mr. Turner’s 4 alleged previous votes to be removed and his 1 vote in his local precinct to be counted; as for his apparent crimes, that’s between him and the authorities. Hopefully for his sake, this won’t be his very last time being allowed to vote for President of the United States, or in any other election, for that matter. But, if it is, I should hope that his one vote is counted next Tuesday; to my knowledge, he still has that right. Each citizen holds 1 share of stock in the United States. It’s high time we each move to protect it, honor it and exercise every bit of power and privilege it provides, while ensuring that nobody is robbed of their own voice. This begins by getting out there and voting in this election. America is yours. Own it. Jim Turner has made a statement claiming that it was all due to a combination of his own sarcasm, as well as his ignorance about how the Internet works. Some websites have since reported that he has been cleared of voter fraud by the board of elections. There is no indication, at this point, whether or not the FBI investigation will continue, or whether or not voting officials have actually gone through the ballots. For a man ‘making a joke’ while thinking he was only speaking to his daughter, the remainder of the messages made in his posts sound incredibly heartfelt and sincere. One would hope that while making his public/news comments in regard to this incident, Mr. Turner – a voter registration volunteer himself – would at least throw in a line reinforcing the importance of ensuring that everyone get one and only one vote. Apparently that wasn’t a priority. Good for you! I did the same and have received emails back from NC State BOE, the County BOE and FBI! ALL are investigating 🙂 WE MUST ELIMINATE THIS OPEN VOTER FRAUD ~ Liberals do not even try to HID it anymore…they THINK Obama will protect them! WRONG! Obama when push comes to shove will never protect anyone but himself! Ruth Nier posted the webshot. She was also outraged and reported it to the N. C. Board of Elections. They were very interested, said he will face a felony count for each illegal vote. I posted the screen shot to many sites and I called the NC vote fraud line and gave the info. I heard from them today and they said they were investigating and if true, this is a felony. I also learned that the fine alone is $10,000 per instance. You might also want to warn about the voting machines. Some are showing a vote for Obama when you really selected Romney. I found this very useful #. Do not be timid about calling and reporting anything you find suspicious. National Election Integrity Hotline 855-444-6100 I am putting this number on my cell phone. Beware of fixed voting machines that show you voted for obummer when you voted for Romney. DOUBLE CHECK!!! The author is more forgiving than I am. Mr. Turner broke the law and if found guilty, should not be allowed to vote in the system he abused. Mr. Turner said he voted multiple times. Until they establish that he actually did vote multiple times and convict him, he has the right to vote. Look further down on this idiot’s Facebook page. On September 24, 2012 he posts that he will be helping people REGISTER TO VOTE!! This idiot needs to be IN JAIL !! Here’s his post: Tomorrow is National Voter Registration Day and I will be part of a group to provide help at Town Hall in Pine Knoll Shores, NC from 10:00 until 4:00. If you will be 18 by election day you MUST register to vote. Have you moved? Have you married? Changed you name?? If any of these apply you need to REGISTER TO VOTE. Yes, I saw that. Rather scary. I hope they look into that as well… and exactly where he got his training including, potentially, what type of training they were doing. Amen Brother, have you got any updates? Just posted an update at the bottom.